A rich, aromatic blend of black Nam Lanh tea leaves and exotic Indian spices, for a deliciously soothing chai tea. With a little black pepper and coconut, to activate and absorb the goodness of turmeric. 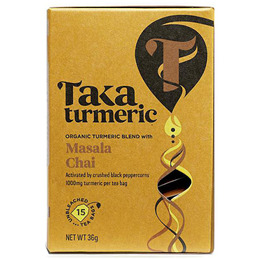 Turmeric (42%), Black Tea Nam Lanh, Ceylon Cinnamon, Cardamom, Grated Coconut, Black Pepper (2.5%), Fennel, Clove. Place a teabag into your favourite cup. Add freshly boiled water to activate the turmeric. Infuse for 5 minutes until dark and golden. For a silky smooth golden chai latte, simply brew using hot milk and sweeten to taste. Below are reviews of TAKA Turmeric Masala Chai - 15 Tea Sachets by bodykind customers. If you have tried this product we'd love to hear what you think so please leave a review. The best tea ever! It is heaven sent. I have been searching for a tea for such a long time... it is healthy and tasty with warmness, perfect with honey. Very tasty tea, early days to say how effective it is as an anti - inflammatory. Bodykind excellent company to deal with service and price wise.